We call Moloka’i the last Hawaiian Island. Take a step back in time……. The oldest known Hawaiian settlement on Molokai was originally located on the East end of Molokai, in Halawa Valley, approx. 650AD. The eastern side of the island was heavily populated in pre-contact Hawaii, a result of ample water from the mountains, fertile and level land for farming, and a rich and abundant ocean. 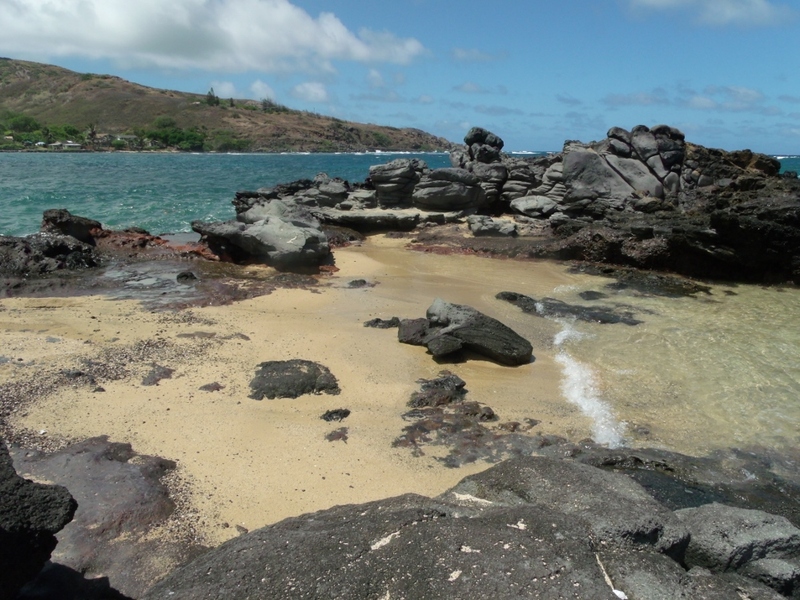 Hawaiians fished the rough surrounding ocean by outrigger canoe with nets and spears for over 1200 years . Early Hawaiians also farmed the land, coaxing sweet potatoes, onions and taro from the harsh volcanic soil. With the vines of the sweet potato, their main vegetable, they fed their pigs, which in turn they used to barter with other villagers in the eastern valleys. *to this day, Moloka’i is famous for their purple Sweet Potatoes. We eat them for snacks as they are so sweet! A drive along the south -east shoreline of the island bears testimony to the reliance on the ocean by early Hawaiians. There are remains from about 60 Fishponds; built in the 13th Century. Some of the Fish ponds are still in use today. Molokai was once renowned for the wisdom and power of its religious leaders, greatly respected and often feared by others in the archipelago. In the 1500s, the famous prophet, Lanikaula, was so revered that pilgrims came from all the Islands to seek his wisdom and advice. Molokai became a place of retreat, protected from war by its religious prestige and the marital alliances of its chiefs. *There is a lot of information/legends regarding the spirituality of Moloka’i. It was considered a “dark” Island for a time…. As the Hawaiians had no written language, most of their pre-contact history has come from chants, passed down from generation to generation, which have kept a chronology of events, battles and genealogy. 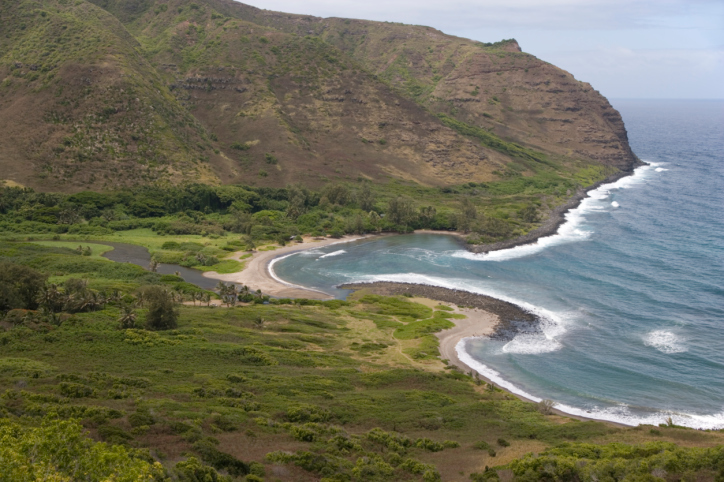 Legend tells us that Laka, goddess of the hula, gave birth to the dance on Molokai, at a very sacred place in Ka’ana. This is recognized on Molokai every May, at a celebration of the birth of hula, called Ka Hula Piko. 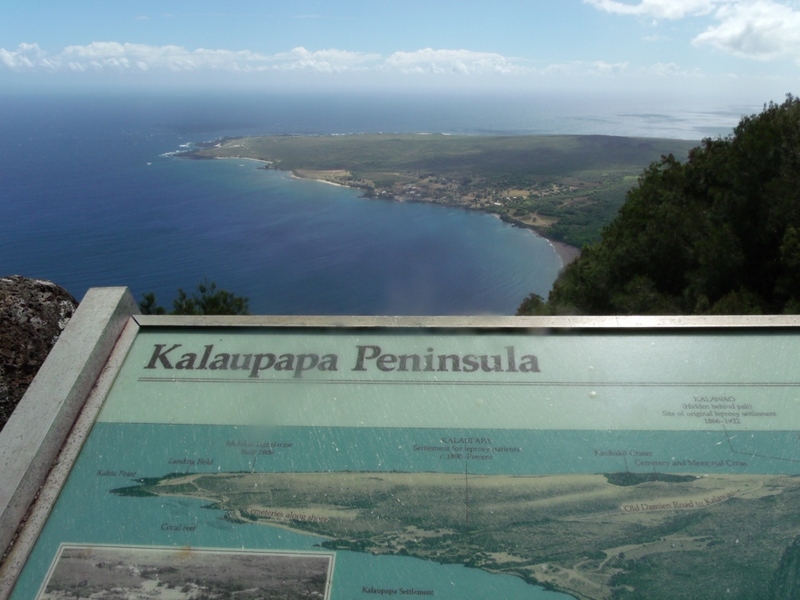 Molokai’s’ most famous attraction is the Kalaupapa overlook to see the peninsula made famous by Father Damien (Saint Damien) and his efforts to help the victims of Hansen’s Disease. Today, the trail from Topside Molokai to Kalaupapa Peninsula is traveled by mule, by hikers, and on foot by some of the workers at the settlement. There is also a small airstrip at the northern edge of the peninsula, used daily to bring in food, supplies and visitors. The trail is over three miles (5km) long and descends 1,600 feet (488m) to the peninsula. Along its course are 26 switchbacks that corkscrew in and out of canyons and ravines. I did Roy’s Molokai Mule ride down this trail to start our Tour about 10 years or so ago. Hence the older looking photos, they are pre digital camera. You have to have permission to use this trail. In 1832, less than 50 Years later!!!! The first Mission was built to serve an estimated population of only 5,000 people. How sad is that! *There is so much history of Moloka’i that I can only just touch on the subject. For more information try VisitMolokai.com or wikipedia/Molokai and many other web sites. **btw> I deliberately misspell Moloka’i occasionally in these posts, as Google does not recognize the ‘ in Moloka’i.